Que diriez-vous d'une petite carte juste pour le fun ? Prise d'une furieuse envie de scraper, un petit tour sur le Colour Q et hop, une petite carte estivale pour fêter l'installation durable (?) du soleil chez nous. J'ai utilisé pour cette occasion ma découpe parapluie DieNamics que j'ai utilisé comme un parasol et des papiers October Afternoon. This is my entry for the current CQC challenge. The combo is really peachy and fun so I've made a card for the summer ! Hope you have a great summer like mine! Ta carte est trop chouette! En plus, elle sent bon l'été! Une superbe carte clean ! 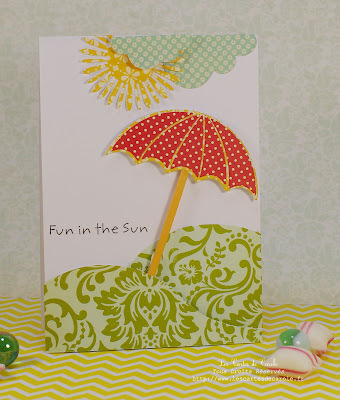 This is such a fun card, Carole, love that umbrella and the sentiment that looks like it was hand written! thanks for sharing your card with us this week at the colourQ. Love your beach scene, love that umbrealla. Thank you so much for joining us this week at the colourQ! love your card and how you used the colors! 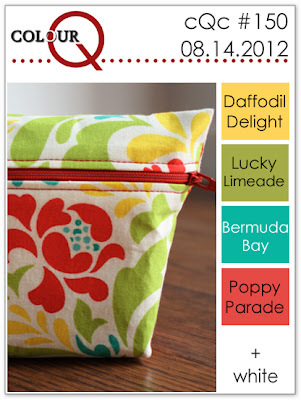 thanks for playing along with us at ColourQ this week! This is adorable...makes me ready for my vacation, comin' up soon! Thanks for playing with us at the CQC! Oh, so cute and fun - what a fabulous creation. Thanks for joining us at the Colour Q this week. ooo I love these colors, and such a fun card!